If you are shopping for a diamond engagement ring, you probably have already noticed the impressive prices a diamond with high color and clarity can bring. Whether you’re still on your way to make your fortune, or, if you simply just don’t want to pay $20k+, laser drilled diamonds are the ideal choice. While there are many alternatives, natural diamonds possess intrinsic qualities unmatched by any other gemstone on earth. Their sheer brilliance and beauty has been celebrated by starlets and treasured since early civilization. They’ve become symbols of love, affection and affluence, often prized by men and women across every culture. Even chemists are captivated by their superior strength and fascinating molecular structure. So, what are Laser Drilled diamonds? Laser drilling is a process to improve a diamond’s internal clarity. It is performed on natural diamonds with obvious dark inclusions. A microscopic laser is used as a cutting device to remove the spot, resulting in higher clarity. Improved clarity translates to more sparkle. The drilling technique is clean, precise, and does not interfere with the integrity of the diamond. The GIA deems the process permanent, meaning it will maintain its stability and visual appeal for a lifetime. Unless disclosed, a laser drilled diamond does not have any filling. They are as brilliant and stunning as a non-drilled diamond of the same clarity. See video below. In addition, laser drilled diamonds require no special care. They can be handled like any other natural diamond. Forward thinkers in the trade equivocate laser drilling to cutting. Just as a rough diamond is cut and polished to improve its appearance, a diamond can be drilled to achieve its maximum beauty. The surge of supply in the late 19th century prompted what we know today as grading. This system was used to rank quality, with clarity being one of the characteristics measured to determine value and beauty. Diamonds with noticeable dark inclusions fell into a lower category of marketability than their eye-clean counterparts. This manner of sorting lead to the creation of universal grading systems we still use today. This allowed for a way to monetize and describe a diamond’s physical properties. For almost a century, it was impossible to remove dark inclusions within the stone. The process eventually became easier with the invention of the diamond saw, allowing manufacturers to remove unwanted carbon spots. However, it only offered a limited ability to remove the dark spots efficiently. It wasn’t until the trade started using laser technology in the 1980’s when dark inclusions could be removed in an extremely precise and carefully controlled manner, we now call laser drilling. A laser drill can improve the diamond’s appearance by one or two grades. This means that a diamond starting off with I2 clarity can be elevated to an SI2 or SI1. What is the price advantage when comparing non-laser drilled diamonds vs. laser drilled diamonds? Depending on the variables, which with diamonds means characteristics (color, cut, clarity, carat weight, symmetry, polish, etc. ), a laser drilled diamond can be priced significantly lower than one that has not undergone the process. In general, the price of a laser drilled diamond will be around 50-60% less. 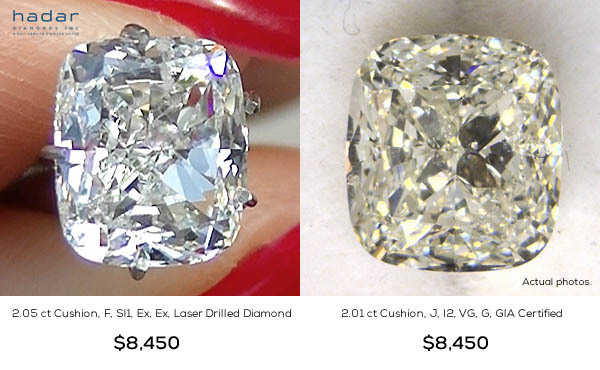 To compare based on price, we have depicted two cushion cut diamonds offered at the same price. As you will see, the 2.05 carat laser drilled diamond rates higher on color, clarity, polish, and symmetry. Because of its combined characteristics, it is white with more sparkle and fire than the non-laser drilled diamond. Both photos are untouched and shot in similar lighting conditions. So does this mean laser drilled diamonds are better than ones that are not? Many people do not know that there is more than one choice when it comes to buying a beautiful, natural diamond. The intent of this discussion is not to persuade or dissuade. Rather, it is to educate prospective diamond buyers on available choices. Laser drilled diamonds are an ideal option for consumers wanting more beautiful sparkler with higher carat weights and clarity grades with more attainable price ranges. All while still knowing they have chosen a pretty, genuine diamond mined from the earth. Where can I see a laser drilled diamond? Laser drilled diamonds are highly desirable, and quickly bought and sold. In addition, jewelers may not carry them because they have millions invested in traditional inventory. We suggest consulting with a diamond supplier offering all types of diamonds; certified non-enhanced, GIA certified natural HPHT, laser drilled, and clarity enhanced. This will provide an unbiased avenue for you to be fully educated and buy the diamond that is right for you. You are invited to view a series of actual videos of laser drilled diamonds. We encourage you to compare beauty, price, and carat weights with non-laser drilled stones. For serious inquiries, you may also preview a selection in the comfort of your own home. There is no charge or obligation to view. Contact Hadar Diamonds today to learn more. *Values determined February 2016. Subject to change according to market conditions.